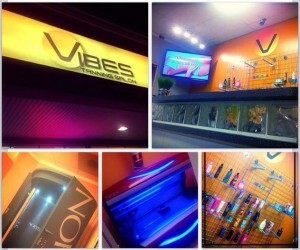 Vibes formally known as “Island In The Sun” is a family owned business since 2005. The business changed ownership at the end of 2014 and shortly after was re-branded Vibes. We strive to provide our customers with the best tanning experience around. To work on achieving this goal 2 Level 4 beds were purchases and installed along with a Norvell Auto spray tan machine. Packages and pricing were also updated including the introduction of our Diamond level. The salon is constantly being updated give you the best experience possible from the moment you walk in the door till the moment you leave. Your feedback is important to us please feel free to submit your comments by click on the “Contact Us” link above.